When Ange Posey opened her business last year, she wanted a name that fit the bill. 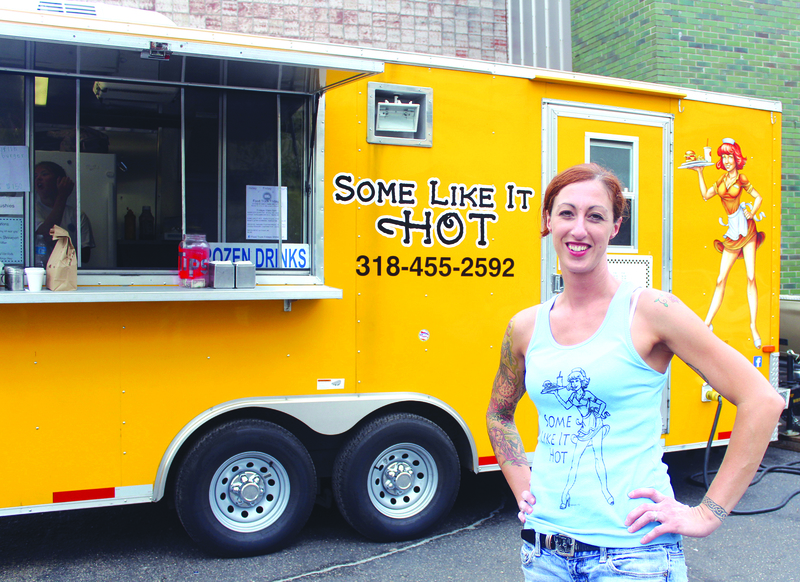 The Some Like It Hot Food Truck has been serving up and dishing out handmade food creations to locals seeking a lunch that’s far from the average cheeseburger and fries. Posey, a Haughton resident, operates out of a mobile kitchen that’s hard to miss on the streets with it’s standout color and logo. Every day, she and her crew ready themselves for what could be a chance to introduce someone to their food for the first time. They hand slice vegetables and press burgers by hand as part of their daily guarantee to keep it fresh. Another popular item is their chicken burger, listed as either bacon cheddar or with a Cajun kick. “It’s healthy, full of flavor and someone no one else does,” Ange said. Lunch items are reasonably priced, ranging from $3 for a grilled cheese sandwich to $7.50 for an eight ounce stuffed cheddar bacon burger. Their lunch menu includes quarter pound hot dogs, from a regular dog at $3 to a BBQ dog for $3.50 and a Bacon Bleu dog for $4.50, and a list of side items. For an additional $2, customers can get a dish of fresh cut potato fries, a staple at the Some Like It Hot food truck. A notable feature on their menu is that, even with set ingredients on each sandwich, customers can still personalize their food based on personal preference. Things like ketchup, jalapenos and raw onions can be added at no additional cost and bacon can be added for $1. Sandwiches can also be made into a wrap for an additional 25-cents or into a salad for 50-cents. If it’s the early morning favorites you’re after, Some Like It Hot offers a breakfast menu. Topping the list are classics like pancakes, eggs, sausage and hash browns. For those seeking something extra can choose from five different omelets, including one that’s loaded with meats and vegetable toppings or one with just the vegetables. “I like cooking breakfast. It’s comfort food,” Posey said. Their most popular items is the $4 breakfast burrito, stuffed with sausage, eggs, cheese and a few extra toppings. If it’s a full meal you want, Some Like It Hot offers a Button Buster – served with two pancakes, two eggs, bacon, sausage, hash browns and toast for $9. In the past month, Posey and six additional food truck vendors have been working together to create what’s been called Food Truck Fridays. They set up at Collier’s Custom Classics & Hot Rods, 2915 Youree Drive in Shreveport, each week to be a one-stop lunch spot for food truck fanatics. Ange, however, doesn’t view them as competition. Posey’s own Facebook page updates their schedule and locations weekly.Posey will also be serving up her breakfast and lunch selections at the Haughton Farmer’s Market on Saturday, Aug. 10. The Some Like It Hot food truck is open 10 a.m. to 2 p.m. at Phoenix Underground (located on the corner of Market and Milam) in downtown Shreveport on Wednesdays; with the Mobile Food Group at Ernest’s Orleans (1601 Spring St. in Shreveport) on Thursdays; and Food Truck Fridays at Collier’s Custom Classics & Hot Rods (2915 Youree Dr. in Shreveport) on Fridays. They currently accept payments of cash, credit and debit. For more information, visit their website at www.somelikeithottruck.com or on Facebook at www.facebook.com/SomeLikeItHotFoodTruck.